I hated them a little less after the icing was dry and I had time to think back on the day we went for a run together and ended up sitting next to each other at the mall trying to guess what everyone had come to purchase while sharing a giant cinnamon bun that threatened to destroy my arteries. Although to be fair, I had way less than half. That idea just ate and ate and never gained a pound. Anyway... want to make some? You don't even have to own a popsicle cutter. I just took a wobbly old circle cutter that wasn't quite circle shape anymore and bent it into a popsicle shape. It literally took me 7 seconds. If you have metal circle cutters, you really should just make one into a popsicle and buy some plastic circle cutters. They don't lose their shape so easy. 1. 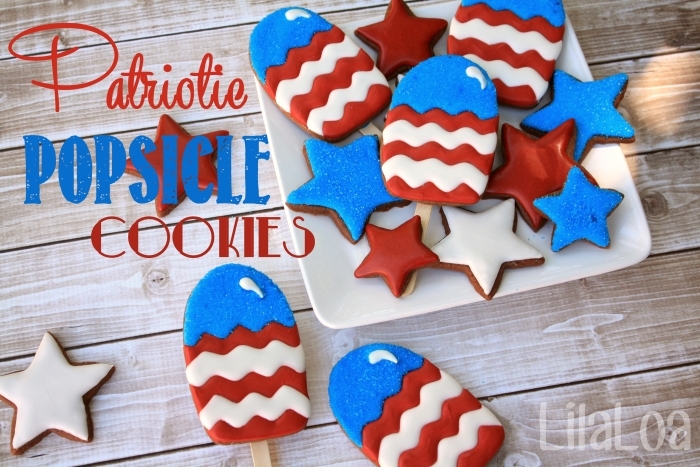 Make a popsicle cutter from a circle cutter or buy one HERE or HERE. 2. 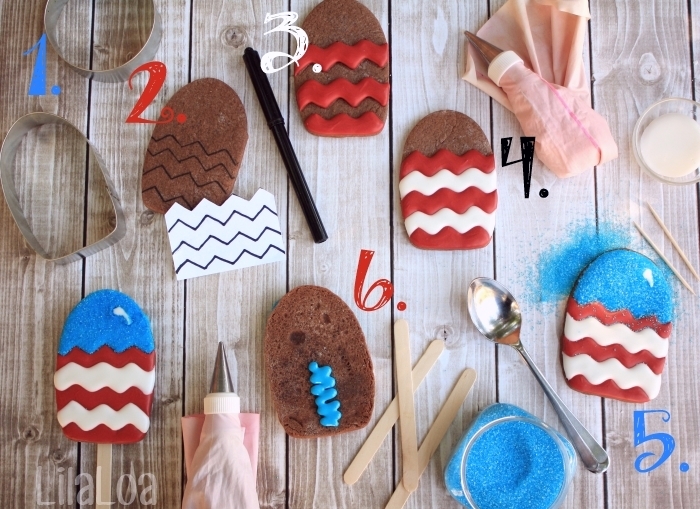 Print out a chevron pattern and trace it with a food color marker to create chevron stripes on the cookie. 3. 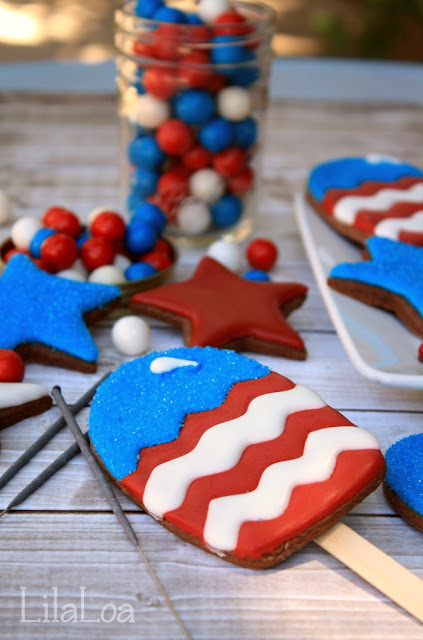 Fill in the red stripes with 15-17 count red icing and a #3 tip. Go for the slightly rounded chevron look to avoid as much stress as possible. Let it dry for a couple of hours or overnight. 4. Fill in the white stripes with 15-17 count white icing and a #3 tip. Let it dry for another hour. 5. Fill in the top part with 15 count blue icing. Cover with blue sanding sugar. When the blue is dry enough to shake off the excess sanding sugar, add a shine line with white icing and a #2 tip. Let dry for 2 more hours. 6. Pipe a zig-zag on the back with thick royal icing in whatever color you feel is most appropriate. 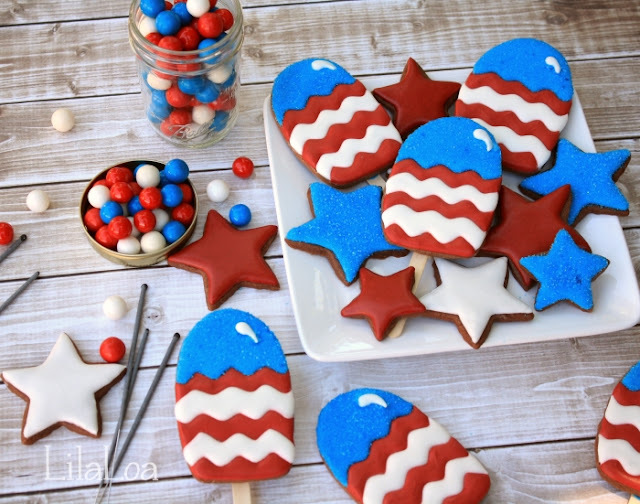 Press a popsicle stick into the icing and allow to dry for another hour.